Preheat oven to 350. Pulse graham crackers in a food processor or blender until it becomes crumbs. In a bowl combine crumbs and butter until moist. Press mixture into a 8 inch pie pan and bake 10 minutes. Let cool. Put cheesecake filling ingredients into a food processor and blend until smooth and creamy. Pour liquid ingredients onto the baked graham crust and place into the oven for one hour. Garnish with Candied Nuts. Heat maple syrup, vanilla and butter on medium high heat until bubbling and cook 2-3 minutes. Pour hot syrup on top of nuts and let cool completely. 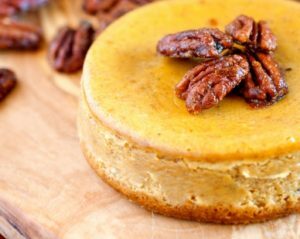 Garnish cheesecake with candied nuts. Enjoy!